In 2010, exeGesIS undertook a project for Cefas to create a toolkit to analyse fishing effort in English and Welsh Inshore and Offshore waters. Further updates to the toolkit were undertaken in 2013-2014 to handle alterations to the source data and provide additional functionality. 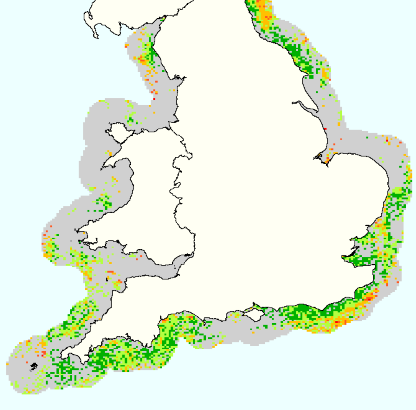 Cefas have a responsibility to monitor the intensity of fishing activity. Data was collected using monitoring patrols that record any sightings of fishing vessels. To remove any observation bias from the sightings, GPS data was also collected showing the route followed by the patrol vessel. Cefas had an existing manual process that was used by a specialist to import the GPS tracks and vessel sightings from the Cefas monitoring vessels and undertake the analysis of standardised fishing effort in MapInfo. The objective for this project was create a toolkit that would automate the processing steps so that non-technical users could undertake the analysis. The Fishing Effort Toolkit was developed in MapBasic and added a custom menu to MapInfo that allowed users to configure the toolkit and undertake the required processing steps using user-friendly interfaces. The toolkit was optimised to use data from the preceding processing stage when available so that the processes could be run with minimal user input.